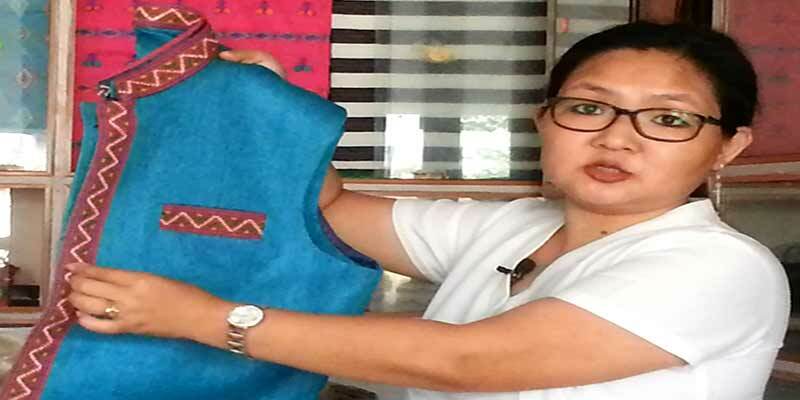 Modern look of traditional dress is the need of today’s fashion, specially in Arunachal . Tribal’s identity and culture can be protect. through this – read this report by Pradeep Kumar. “Loss of culture is loss of identity” goes the adage. The impacts of modernity have been steadily threatening the most productive cottage industry of this industrially poor state with the indigenous populace getting drawn towards modern dresses. Indigenous tribal people including young and old using modern dresses while suing their traditional dresses occasionally during festivals are the glittering proof. The visionary CM was well aware of the cascading impact of modernity. Thus, realizing the cascading effects of modernity on rural economy, social worker Binny Yanga Maya like “a silver lining behind every dark cloud” had made conscientious efforts to promote traditional dresses and beads by producing and selling them though her Oju Welfare Association (OWA). Though the Apatanis were the first to showcase the unique traditional dresses at national level, but the Nyishis brought a revolution in their traditional dresses and beads to carve a niche at all levels. Binny left for her heavenly abode but left behind her legacy that has been gaining grounds with every passing day. The OWA craft centre has turned out to be hub to promote state’s unique culture. State Governor Brig (Retd) B D Mishra and his wife Nilam Mishra have been showing keen interest to promote state’s culture. While she was clad in traditional dress procured from OWA on last Independence Day, she has placed order for 50 traditional shawls and the governor for 100 jackets. President Ram Nath Kovin was not only gifted OWA traditional jacket on his maiden visit to the state on 19.11.17, but the governor had gone to Rashtrapati Bhawan to meet him with OWA traditional dresses. Impressed with traditional dress gifted by governor here on 21.02.18, newly appointed 4 Corps GOC Lt Gen Gurpal Singh Sangha has sought samples of traditional dresses from OWA, according OWA chairperson Anya Ratan. Such steps bode well when the indigenous people have been passing through a period of transition leaving the tribal people undecided.